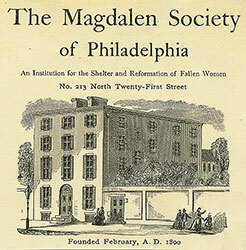 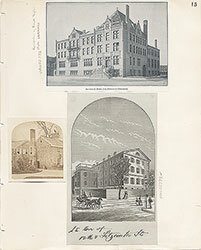 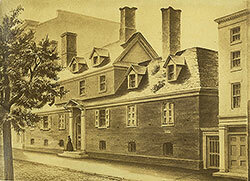 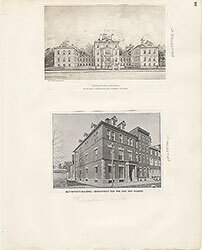 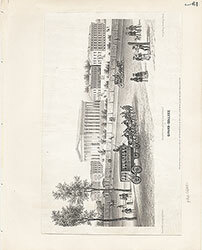 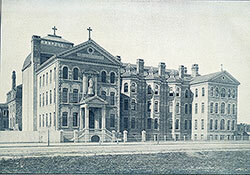 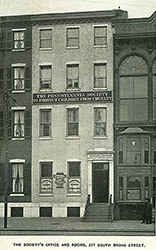 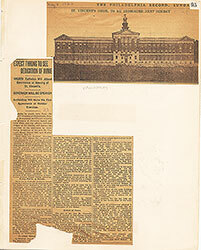 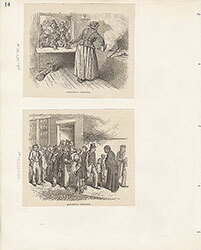 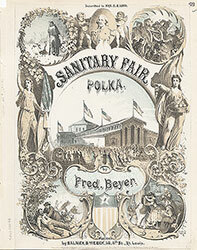 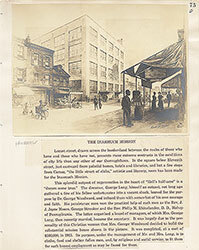 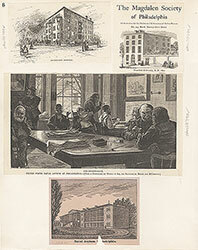 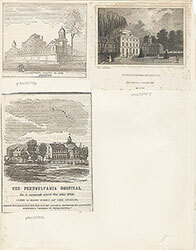 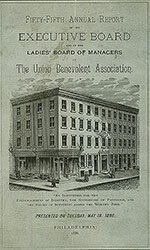 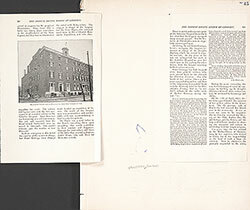 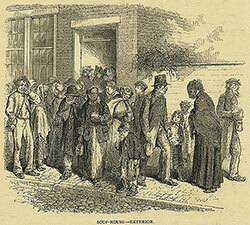 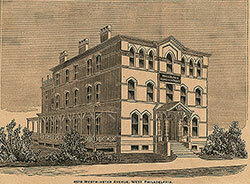 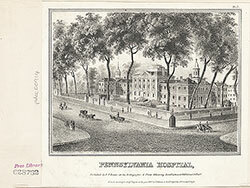 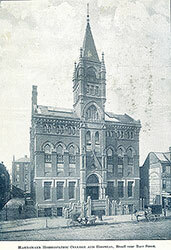 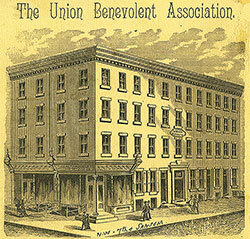 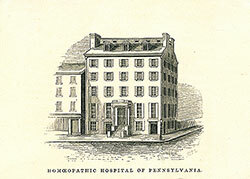 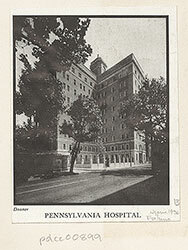 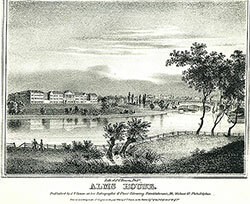 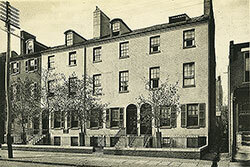 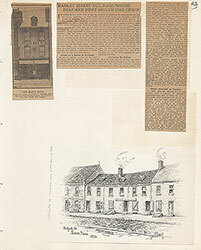 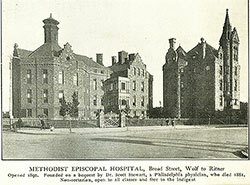 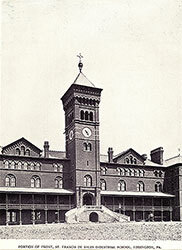 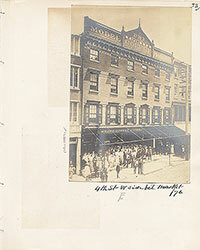 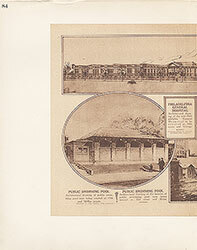 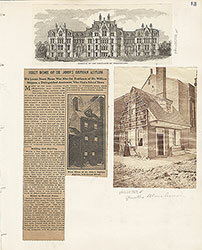 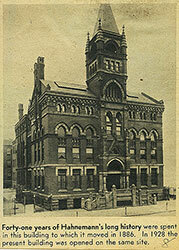 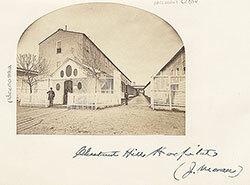 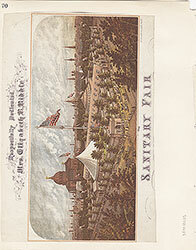 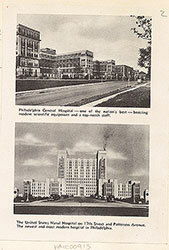 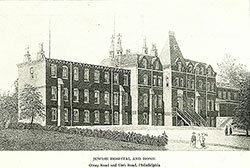 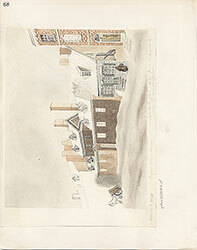 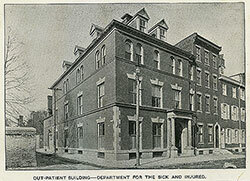 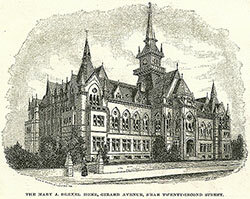 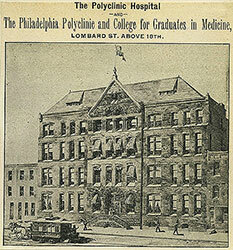 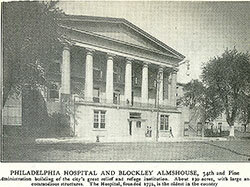 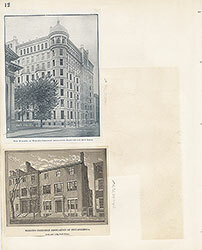 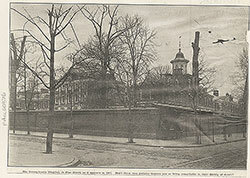 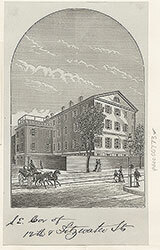 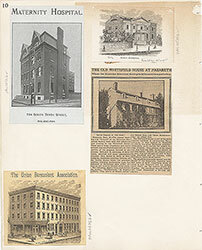 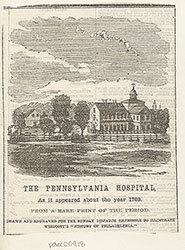 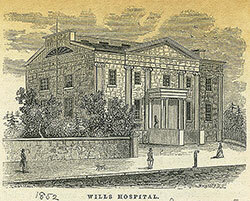 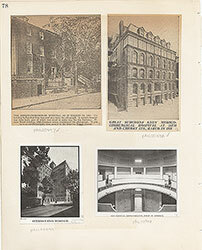 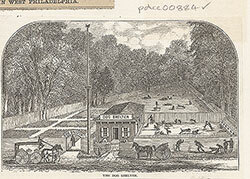 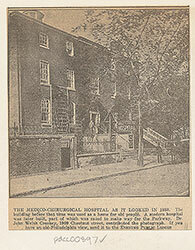 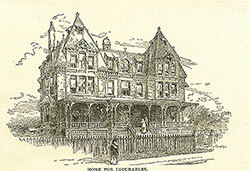 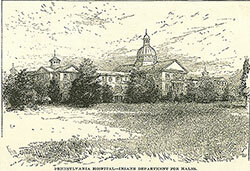 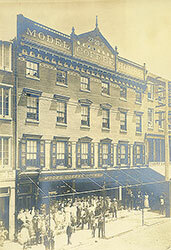 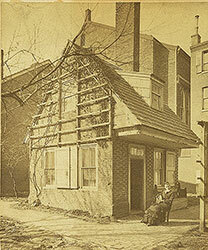 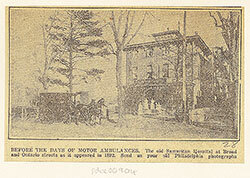 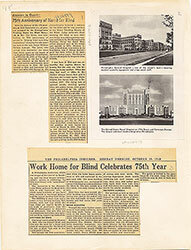 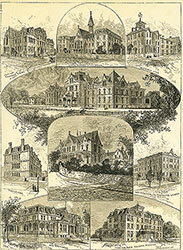 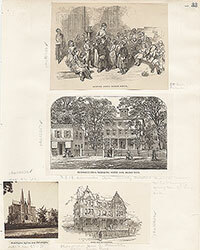 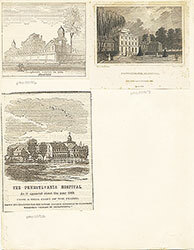 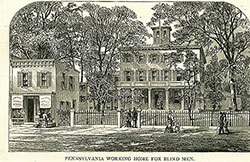 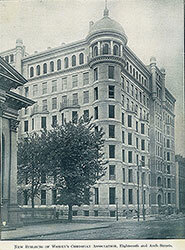 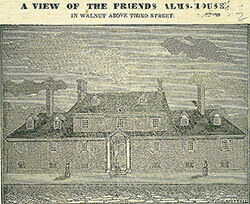 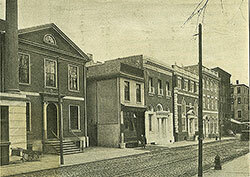 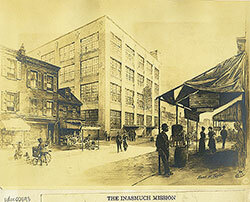 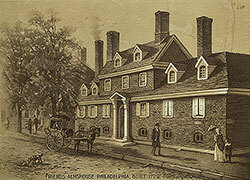 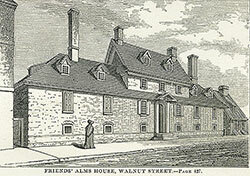 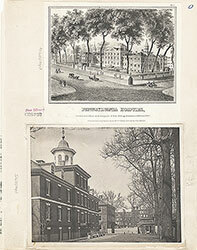 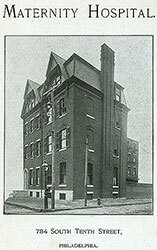 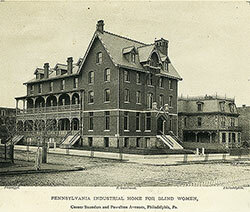 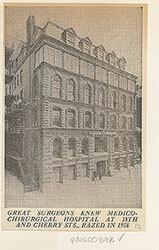 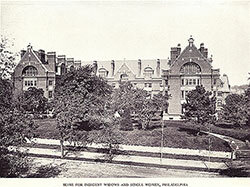 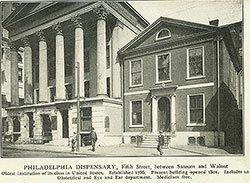 Shows the Philadelphia Dispensary for the medical relief of the poor, on Fifth Street between Sansom and Walnut. 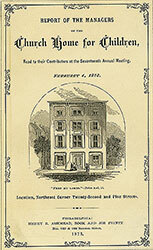 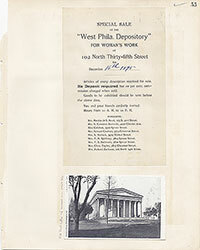 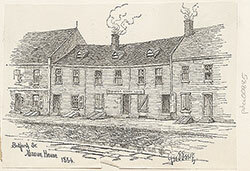 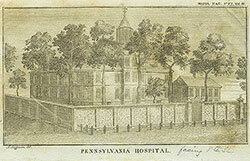 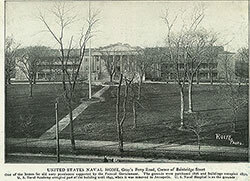 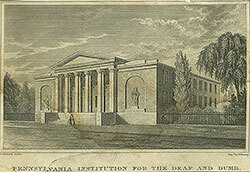 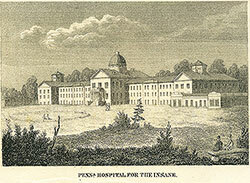 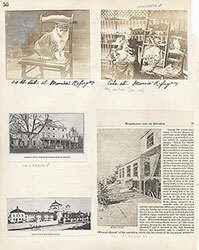 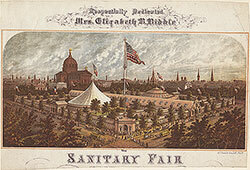 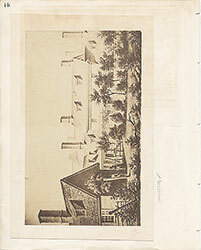 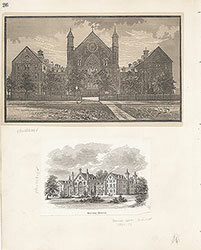 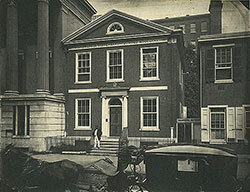 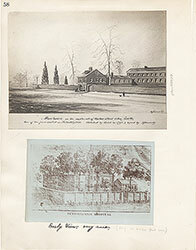 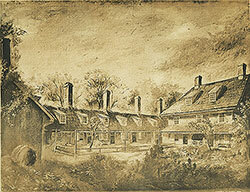 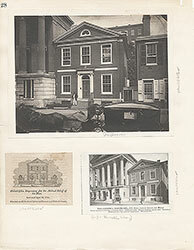 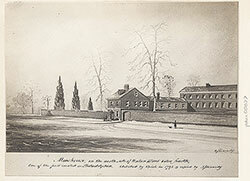 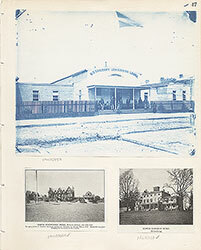 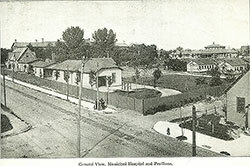 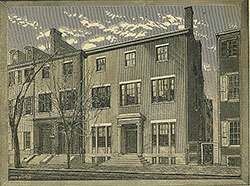 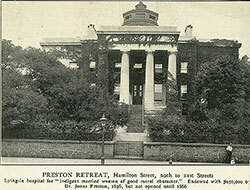 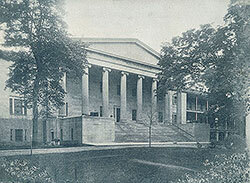 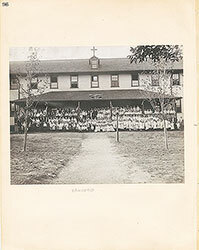 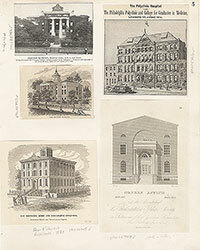 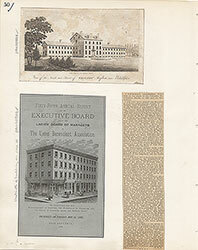 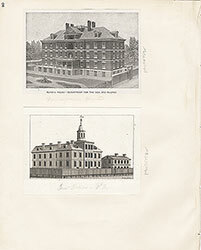 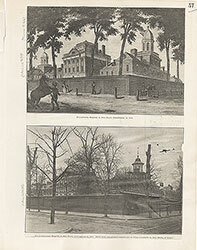 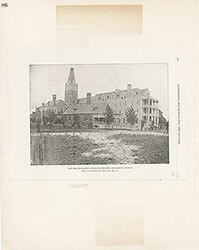 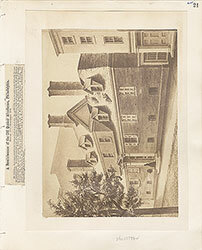 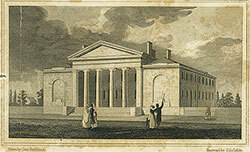 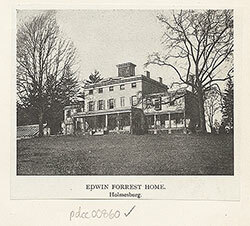 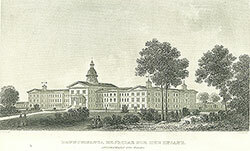 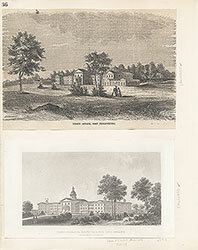 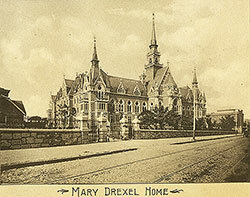 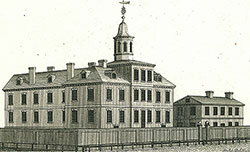 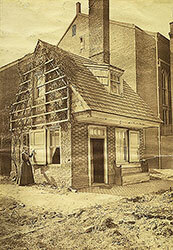 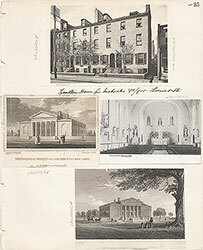 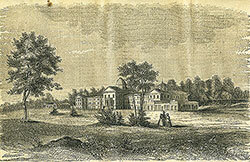 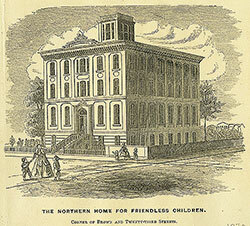 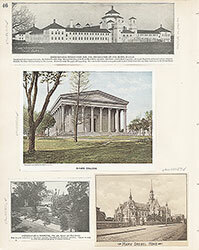 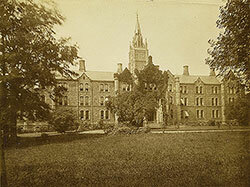 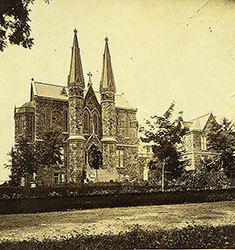 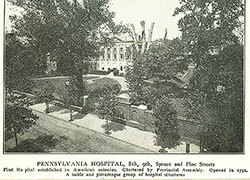 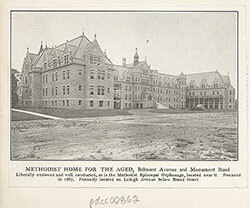 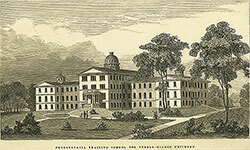 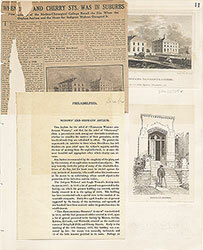 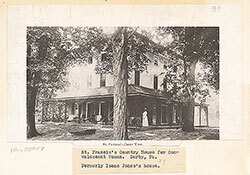 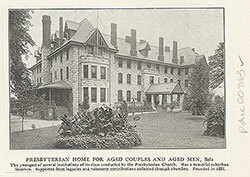 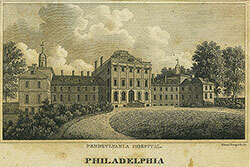 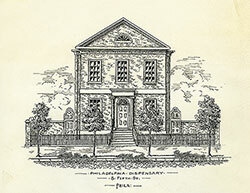 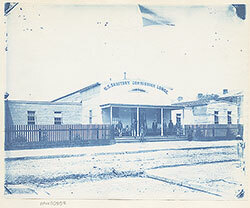 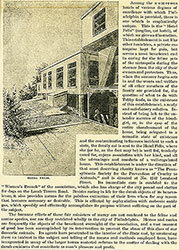 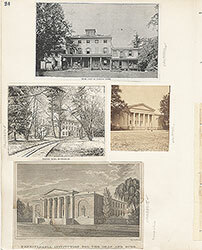 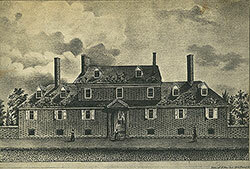 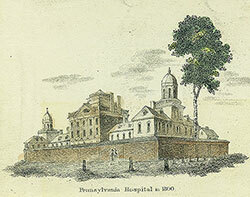 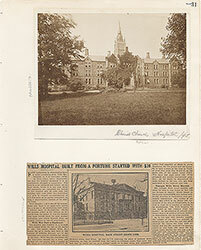 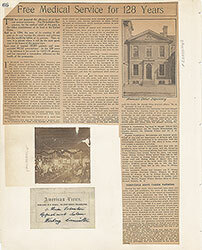 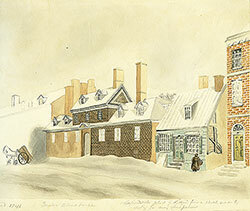 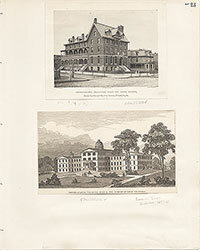 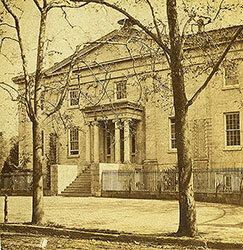 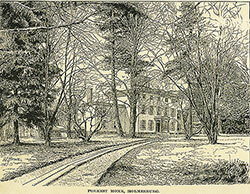 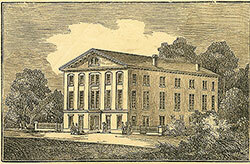 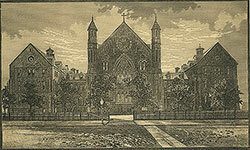 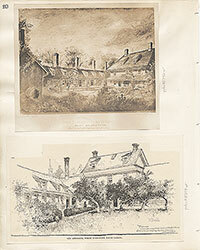 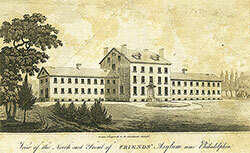 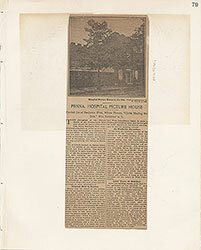 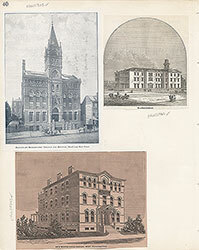 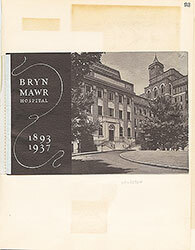 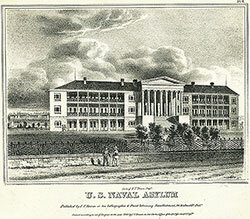 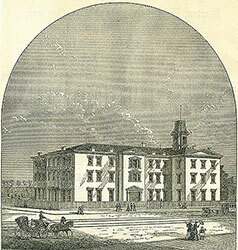 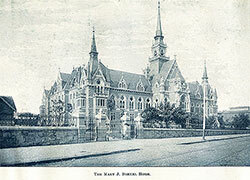 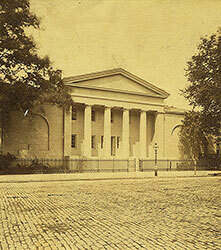 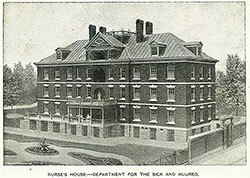 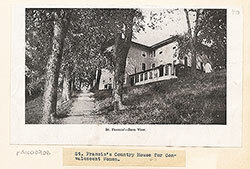 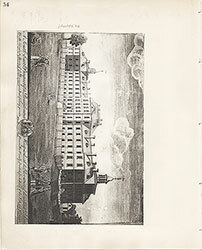 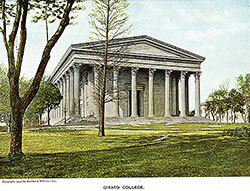 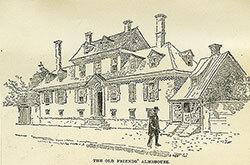 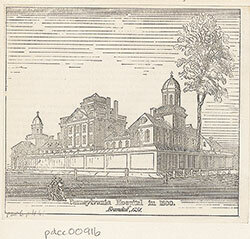 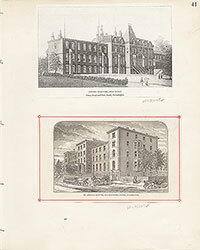 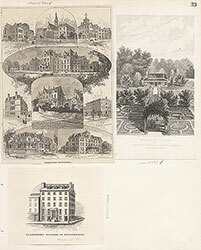 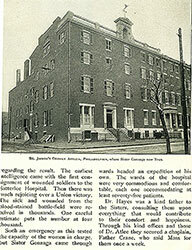 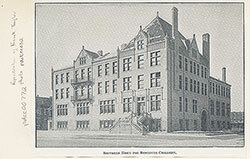 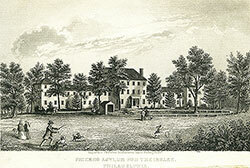 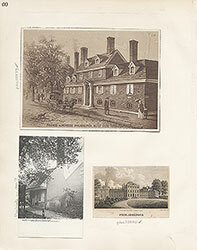 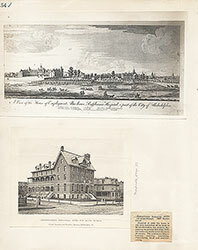 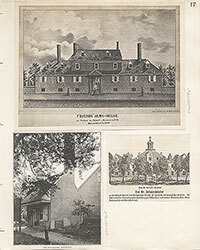 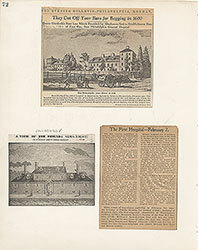 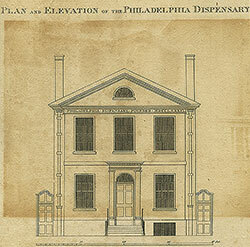 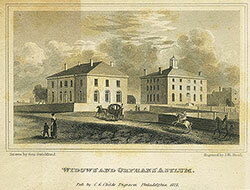 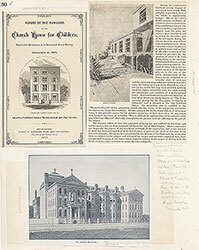 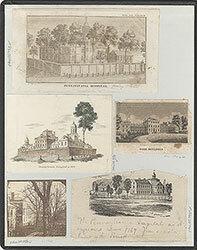 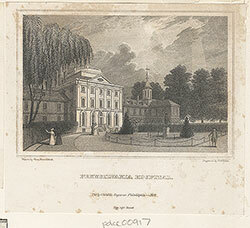 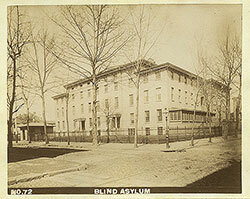 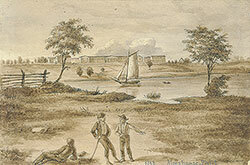 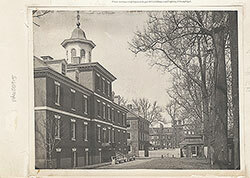 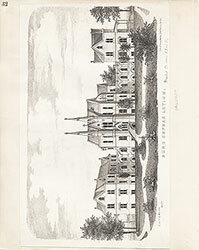 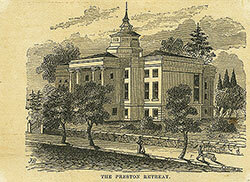 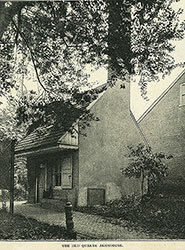 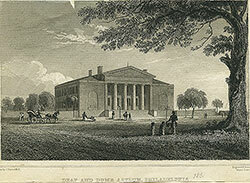 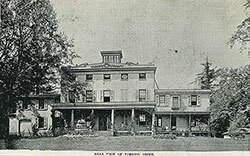 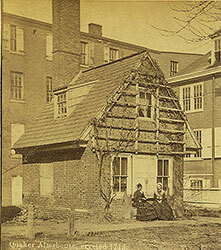 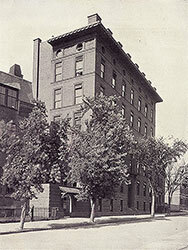 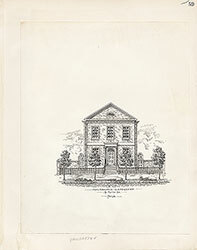 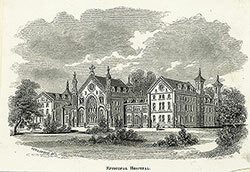 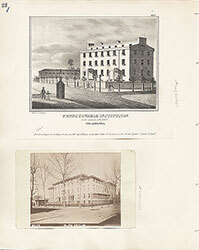 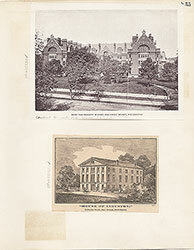 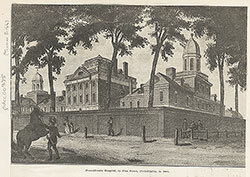 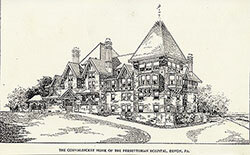 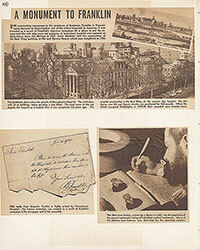 The first institution of its kind in the country, the dispensary was established in 1786 by Dr. Benjamin Rush. 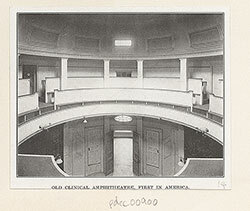 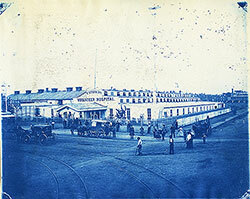 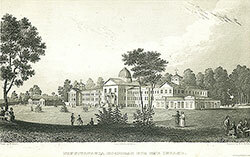 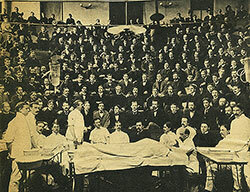 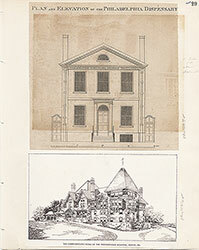 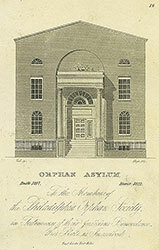 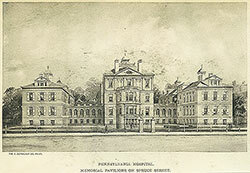 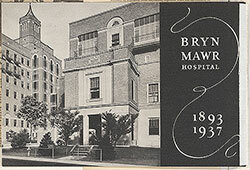 The building on view opened in 1801 and included an Obstetrical and Eye and Ear department. 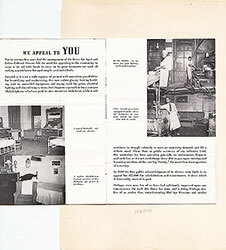 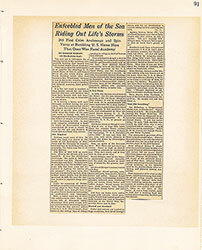 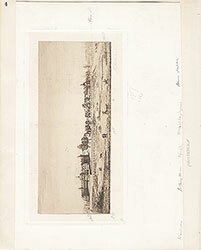 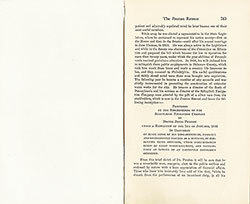 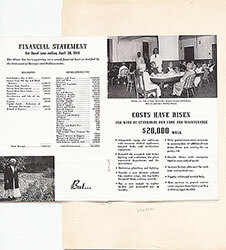 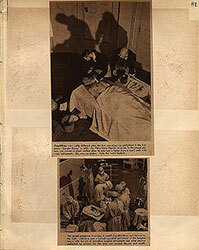 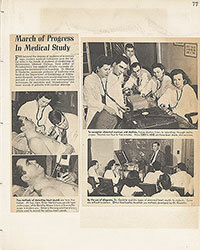 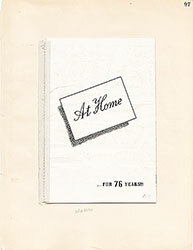 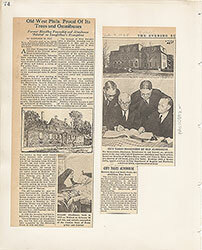 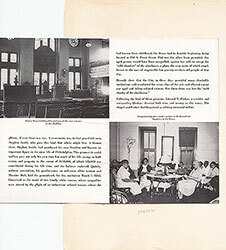 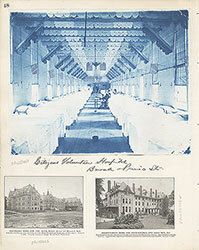 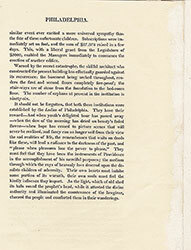 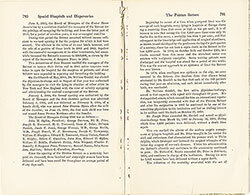 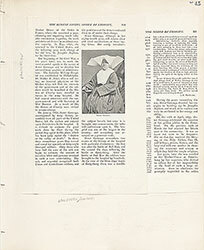 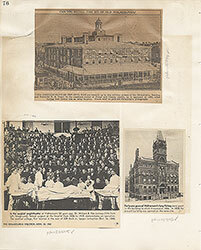 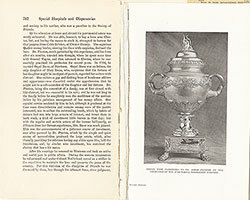 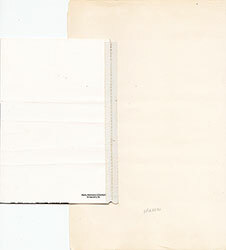 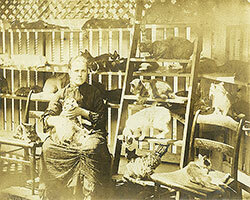 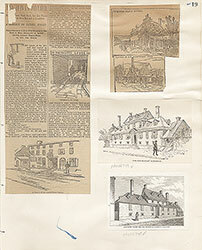 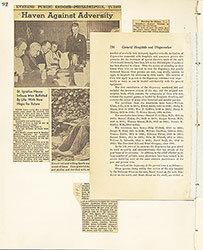 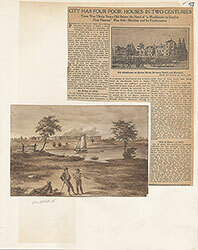 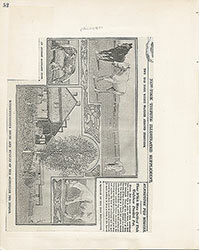 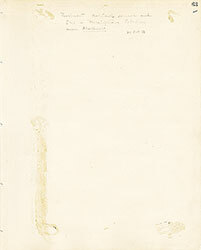 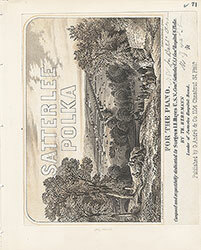 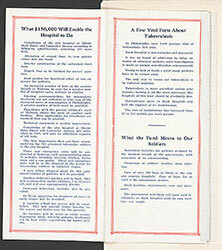 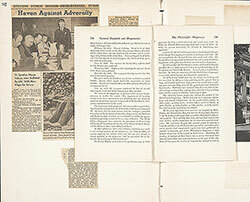 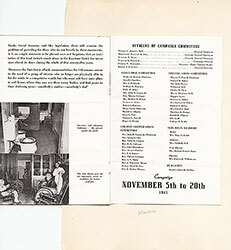 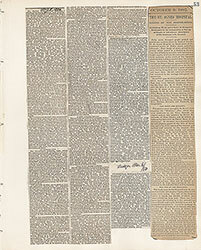 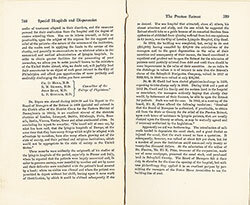 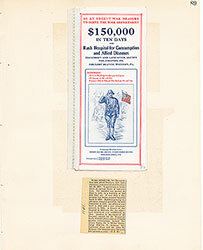 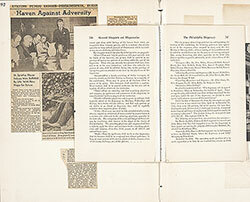 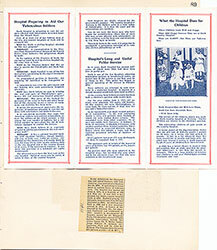 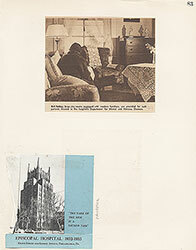 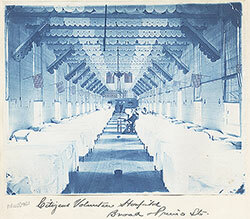 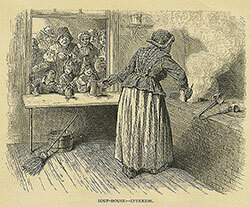 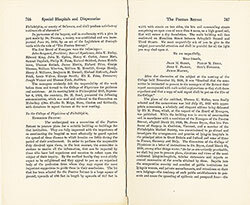 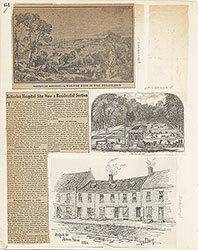 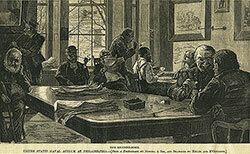 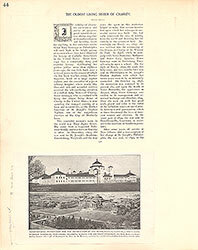 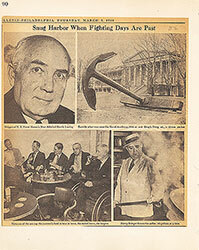 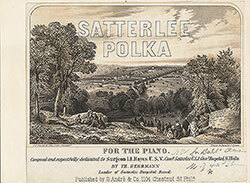 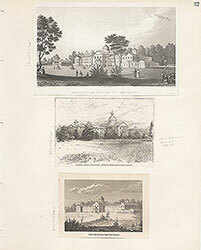 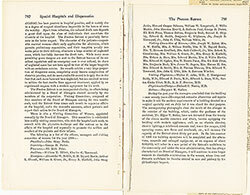 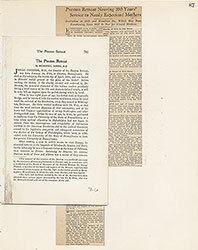 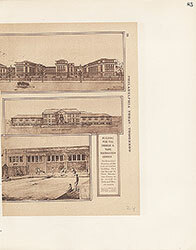 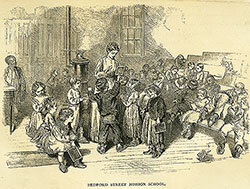 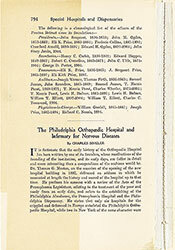 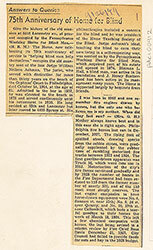 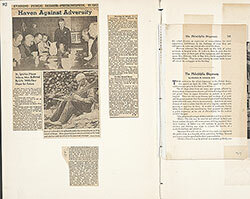 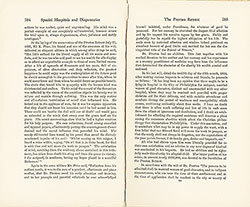 Consulting physicians and surgeons included such notables as Drs. 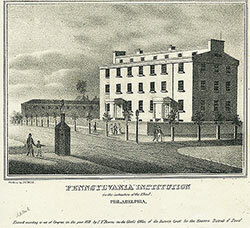 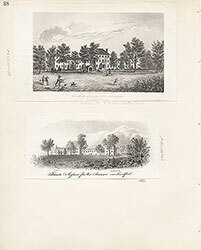 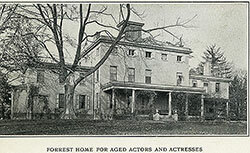 Benjamin Rush, Caspar Wistar and Philip S. Physick. 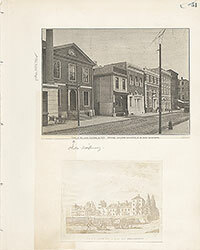 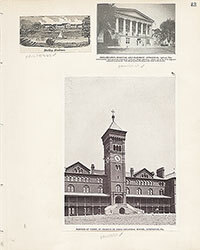 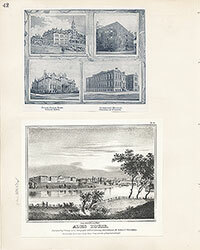 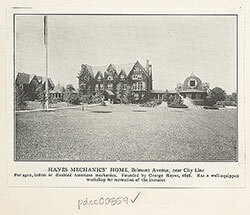 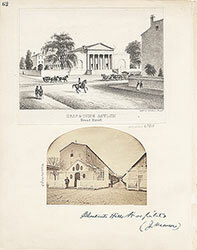 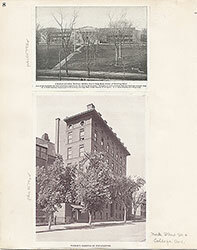 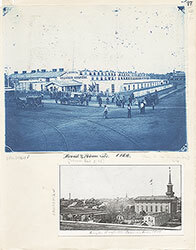 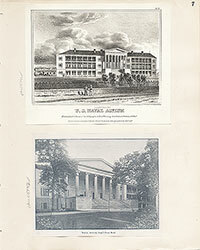 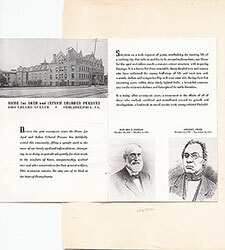 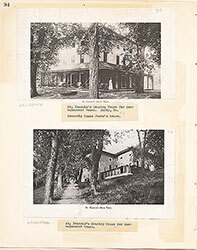 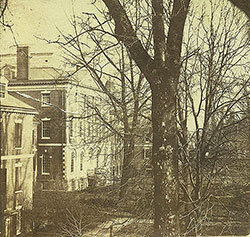 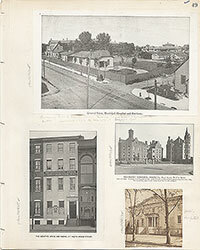 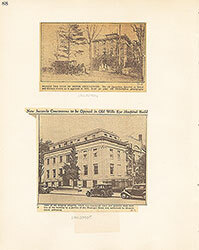 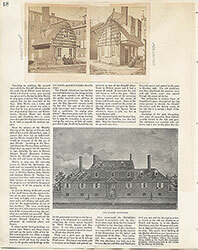 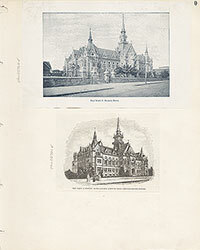 On the left is shown a partial view of the Mercantile Library.